This tall cross was made from the church Christmas tree. The branches were cut off and then the trunk was cut into two pieces (approximate ratio 2:1) and tied together with string. Local churches may have tall crosses that they are prepared to lend. 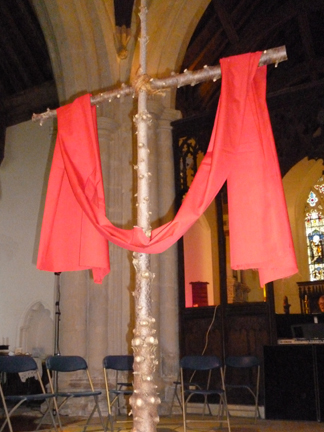 We made this cross for a school Lent and Easter event by tying two pieces of wood together and painting it purple. As part of the event the children decorated the cross with flowers, butterflies and other decorations and it was then displayed in their classroom. At the same time we made a brown cross which has been reused on different occasions. Smaller, free standing crosses can also work well. This one was used as part of a larger display on different aspects of the kingdom but we've also used them as a focus and on their own. This display for our Holiness event used battery candles spread out across the display. 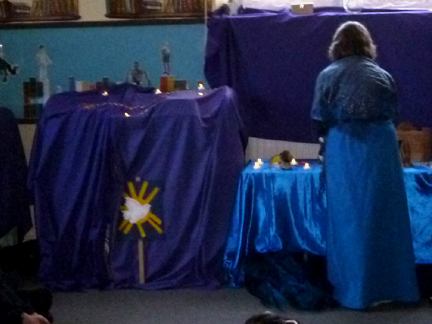 We've also used the wooden flame puzzle, lanterns, unlit candles and the symbol of the sun (here with the dove added to symbolise the Holy Spirit). Real water in jugs and bowls, wave puzzle, blue shimmer stones (small glass stones used for vases etc), strips of blue and white netting. 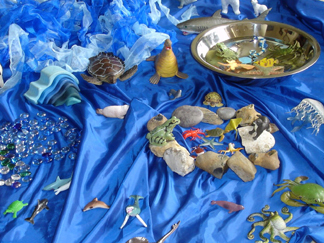 Here we have also used fish and sea creatures, stones and shells. Crowns: The large crown here was made as part of a WI project from gold card and purple velvet. 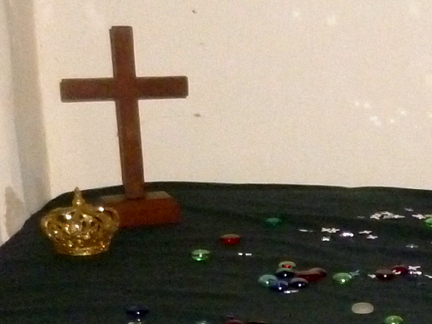 (They also made the orb, the sceptre and the ermine cloak!) We also use a gold fancy dress crown. Smaller crowns are either Christmas decorations, candle holders or made from gold card and jewels. We also use costume jewellery, gold chains (Christmas tree decorations), wooden swords, goblets and platters of food. 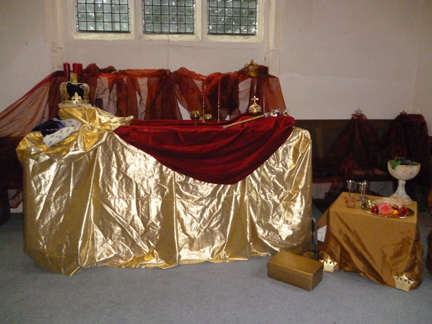 For a contrast with Christ the King we have used a crown of thorns made from twisted brambles.